I like how virtuous and healthy I feel when purchasing something like lentils. Until now, every package of lentils I have bought has sat in my pantry until I threw it away — not healthy and certainly not virtuous! I came across this really simple recipe for red lentil pancakes from Wendy Van Wagner and finally decided to give dried lentils a try. You soak the lentils overnight and then buzz them in the food processor with a few other ingredients before pan-frying. They were really tasty with the turmeric and cilantro, but a bit dry, so take her advice to use them for dunking — I served mine with plain greek yogurt and a big salad…perfect. Rinse the lentils well and place in a large bowl. Cover with 2 cups warm water and soak for least 8 hours, or overnight. Drain the water and place lentils in food processor. Blend until smooth, adding 1 tbsp of water at a time to make a smooth batter (I used 3 tbsp in total). Blend the salt, turmeric, pepper, and cilantro into the batter. Heat a large frying pan over medium heat, and add 1 tbsp oil. Drop spoonfuls of batter to make 4 pancakes, about 3-4 inches wide and 1 inch thick. Cook about 2 minutes, until set. Drizzle a little oil over the top and sides before flipping (I struggled with this and just sprayed a bit of olive oil spray before flipping) and cook another minute or 2 or the other side. Repeat with 2nd batch of pancakes, adding more oil as needed. Serve warm with a big helping of greek yogurt, sour cream, guacamole, applesauce, chutney, or creme fraiche. Makes about 8 pancakes. I love chili and love trying new chili recipes, but let’s face it — the window for chili-making in Texas is pretty tiny. This fact just makes me enjoy it that much more. 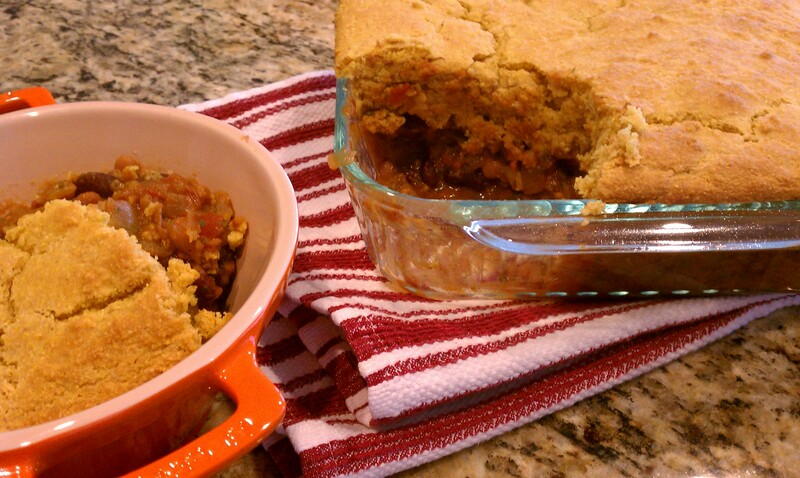 This past weekend was unseasonably cold for February in Texas, and I took full advantage by trying out Ellie Krieger‘s recipe for Chili Bean and Corn Bread Pie. It is a delicious vegetarian recipe with two kinds of beans, green chiles, and lots of spice. The recipe called for ancho chili powder; I had chipotle chili powder on hand and it gave the dish a wonderful smoky flavor. 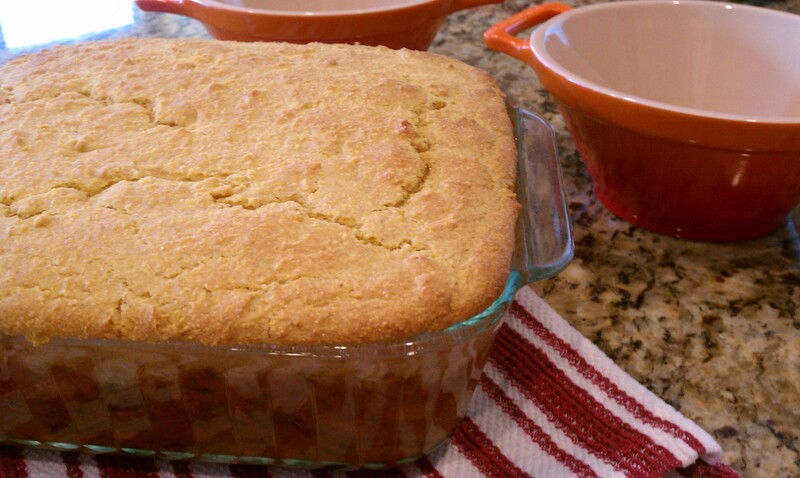 The best part is the very thick corn bread topping made with honey and buttermilk, which sweetens the whole meal when you mix it in with the chili. 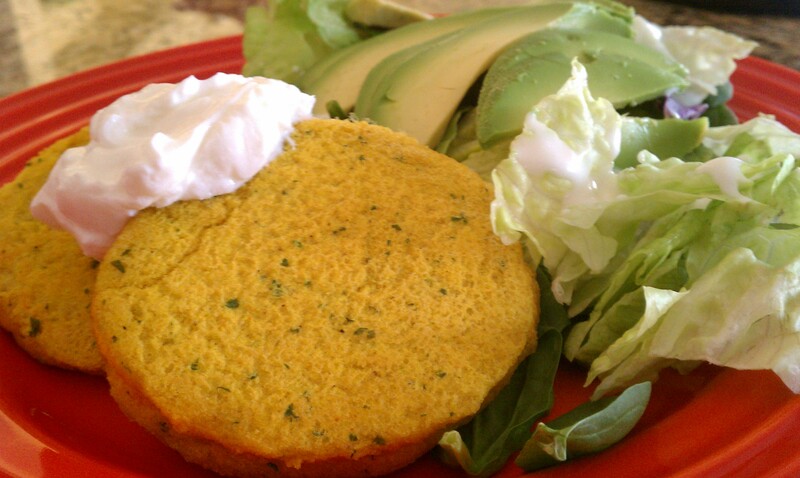 I do like the fact that this is such a healthy recipe, but the extra calories added by including cheddar cheese in the cornbread would be worth it, so I will try this next time. 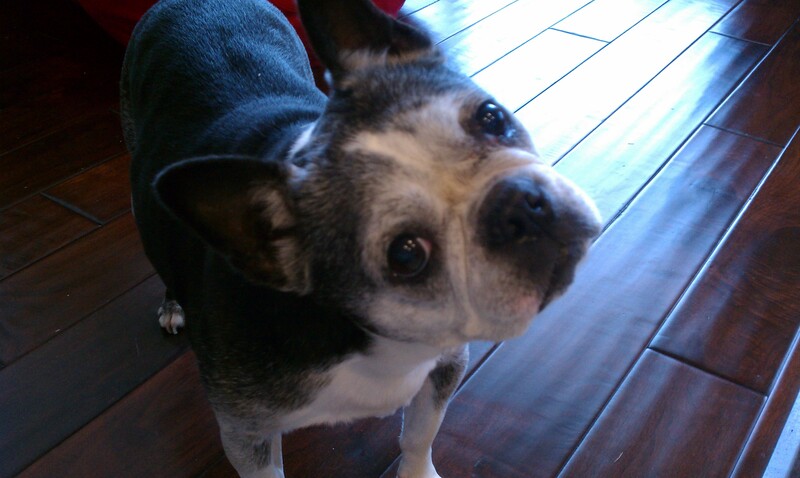 While I was happy that my husband liked the meal, I was most thrilled to see Romeo, my 11-year old Boston Terrier, stalking the oven while the chili baked. He only does this when my Mom visits at Christmas and Easter (and cooks a turkey and a ham, respectively), and never for anything I cook. Preheat the oven to 350F. Spray an 8-inch square baking dish with cooking spray. To make the filling, heat the oil in a large pot over medium-high heat. Add the onion and cook, stirring, until softened and lightly browned, about 8 minutes. Add the garlic and cook for 30 seconds. Add the tomato paste, cumin, oregano, chili powder, and coriander, and cook, stirring, about 1 minute. Add the beans, tomatoes with their liquid, green chiles, salt, and black pepper and bring to a boil. (I found the mixture very thick at this point and added a few splashes of stock). Reduce the heat to medium and simmer until the liquid is reduced by about half, about 10 minutes. Stir in the cilantro and transfer the filling to the baking dish. To make the topping, in a medium bowl, whisk together the cornmeal, flour, baking powder, baking soda, and salt. In another medium bowl, whisk together the buttermilk, egg, honey, and oil. Add the wet ingredients to the dry and stir to combine. Pour the cornmeal batter over the bean mixture, then smooth the surface with a spatula. Bake until the top is browned around the edges and a toothpick inserted into the corn bread layer comes out clean, about 30 minutes. Makes 6 servings. I rarely cook a “real” dinner on Monday nights. The timing of the kids’ activities means there is about a 15 minute window to sit down and eat — sometimes together, sometimes not. 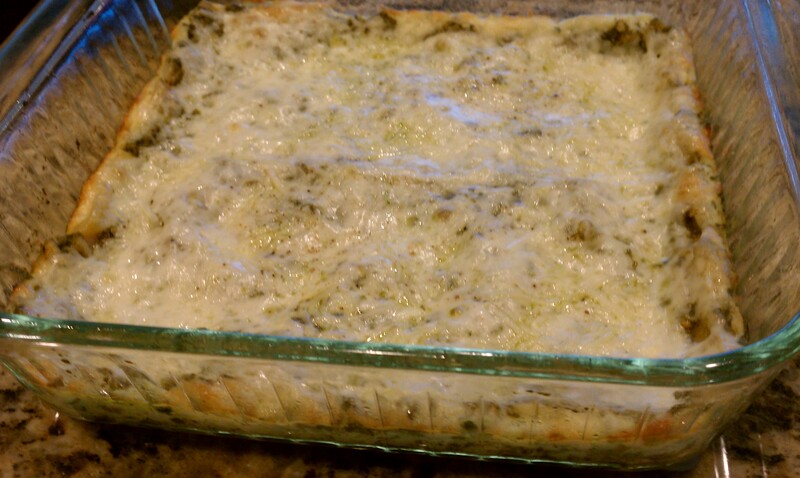 I’ve been wanting to try Bethenny’s Pesto Vegetarian Lasagna for a while, and hoped that with just six ingredients, I could quickly prep this ahead of time and then throw it in the oven during the mad dash activities that tend to occur in our house on any given Monday. I decided to cut the recipe in half, and I added a seventh ingredient – shredded parmesan cheese on top. I covered the lasagna with foil for most of the cooking time. While this was a delicious dish, mine did not turn out anything like the picture in the original recipe! After it came out of the oven, the bubbly cheese settled, and the lasagna was less than an inch thick. so I would recommend this as a side dish, not a main course. The good news — my kids really liked it. The pesto was the main flavor and you just can’t go wrong with basil and cheese.